Monthly planner offers the perfect planning and presentation solution, suiting all office needs. Magnetic Gold Ultra dry-erase surface is scratch-resistant and ghost-resistant. 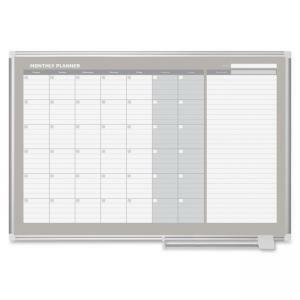 Calendar is ideal for managing teams and schedules with ample room for any month. The write-on/wipe-off month features ruled daily blocks, Monday-through-Saturday scheduling, shaded weekends and a ruled notes column. Modern, sturdy aluminum frame allows the board to fit any environment, and a sliding pen tray keeps all accessories close at hand. Dry-erase planner includes a wall-fastening kit.